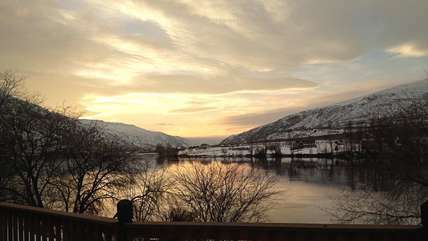 The Columbia River House and Cottage is a beautiful vacation rental home located on 500' of low bank waterfront on the EAST side of the Columbia River just 2 miles south of the Beebe Bridge and 7-10 minutes from downtown and Lake Chelan. This waterfront home has a large grassy yard to run and play in, is in a quieter and more lazy section of the river, and is perfect for family reunions and corporate gatherings. 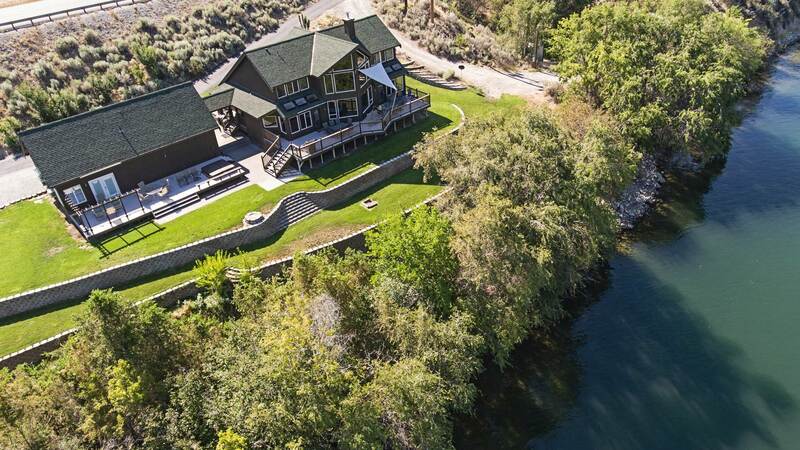 Enjoy complete privacy on this large waterfront estate, with no other homes within 1000'. 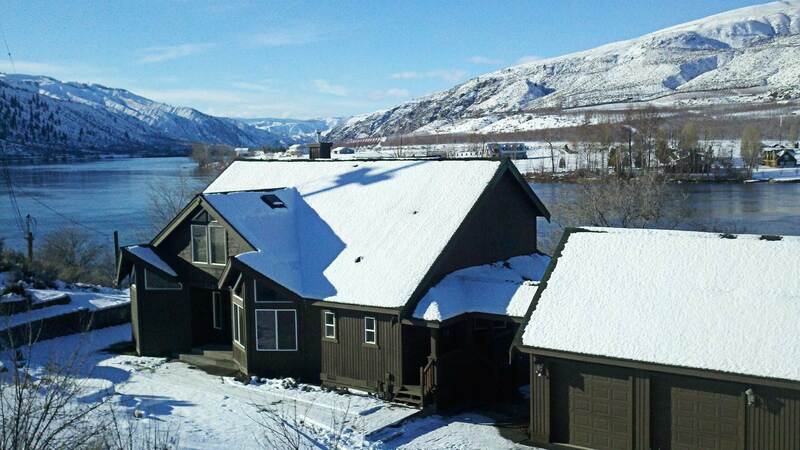 Drink in views from this Columbia River waterfront vacation home of the river and Lake Entiat from the many windows in this spacious and comfortable 3000+ square foot home with additional 1000 square foot cottage. This is the perfect getaway to waterski on the river in the day and to relax in the hot tub in the evening after a big day of playing in the sun. The Columbia River House and Cottage sleeps up to 16 adults (or up to 20 people total including children). The main house has 3 bedrooms, a den, and a playroom, and 2.5 baths which sleeps up to 12 with children, and a cottage with 2 bedrooms and 2 cozy baths that sleeps up to 8 with children. There are two full kitchens and living rooms, large deck spaces with an electric and charcoal grill, and a hot tub in which to soak and relax. This is a perfect location for family reunions or multiple family get togethers, corporate retreats, or small intimate weddings (we even have a gazebo! ), with approval upon booking. This vacation home is sure to be a family favorite. In the main house, the first floor consists of a spacious living room with leather couches and a large flat screen TV with a DVD player and movie library, master king bedroom suite with a large luxury shower, a spacious kitchen with tiled countertops and stainless appliances and everything you need to prepare meals except the groceries, a half bath and laundry room, an office/den area with a queen murphy bed, and large deck spanning the length of the house with tables and chairs for 12 people and BBQ ready for your handiwork (outdoor seating for 20+ people between the two decks). The second floor has a queen bedroom with a mini balcony overlooking the living room below, a large kids room with two bunk beds and a full-sized bed, a playroom with a queen-sized bed, and a guest bathroom with a bathtub. The separate cottage is a cute stand-alone unit that includes a separate full kitchen, living room with sleeper sofa and flat screen TV with DVD player and movie library, and dining area, while upstairs has fun attic-like sloped ceilings with a queen and full bed room, a queen bedroom, and a cozy bathroom with a combination tub shower. There is a separate deck for this unit with table and chairs for an additional 8-12 people, and the hot tub is off this deck. Waterfront, hot tub, satellite TV and movie library, large grassy yard, two furnished decks with, electric BBQ grill, boat buoys, horseshoe pit, and plenty of parking. There are up to 9 vehicles allowed at this property. RV parking available upon request at $25/night per RV. This home is on a Friday turnover during the peak summer months. Dogs must be well-behaved, and are allowed in the smaller cottage or outside upon approval of manager with a $50/pet fee. Just 3 hours from Seattle or Spokane, enjoy boating and watersports, wineries, golfing, hiking, biking, waterslides, and many other outdoor activities during the 300+ days of sunshine a year in the beautiful Lake Chelan valley. The Beebe Bridge Park and Chelan Falls Park are both located on the Columbia River on either side of the Beebe Bridge, and are conveniently located about two miles from this property. These parks offer everything you could want in a park, including boat launches, swimming beaches, picnic shelters, playgrounds, tennis courts, volleyball and plenty of green grass. Experience fresh pressed cider, apple cider donuts made fresh each morning, espresso and so much more at Orondo Cider Works. Just 8 miles down the road this is sure to be a stop on your agenda. 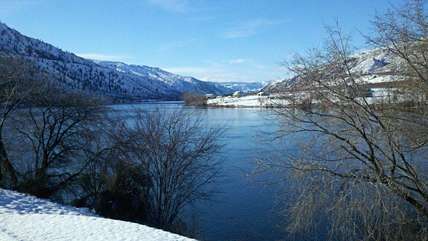 More information on things to do locally can be found on our Chelan Area Attractions page.